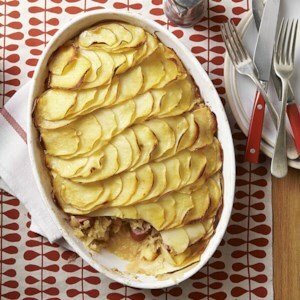 Find healthy, delicious potato casserole, from the food and nutrition experts at EatingWell. 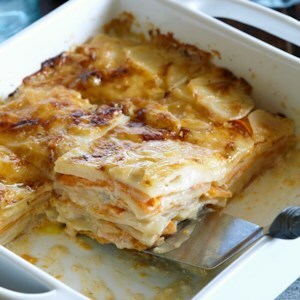 These scalloped potatoes are surprisingly rich and creamy even though they're made with no dairy (milk, butter or cheese)--vegan comfort food at its best. 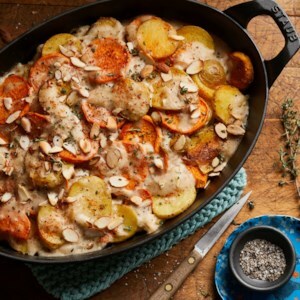 We use almond milk, herbs and spices to make a flavorful sauce and finish the dish with a crunchy almond topping. This makes a satisfying side dish if you're cooking for dairy-free or vegan diets. 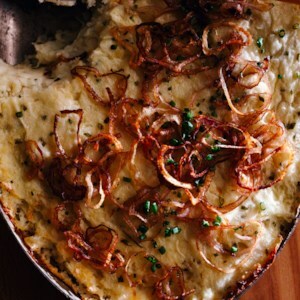 Celeriac adds a bright celery-like flavor and lightens the texture in this healthy mashed potato casserole. The fried shallots are reminiscent of the crispy onions that top a green bean casserole. 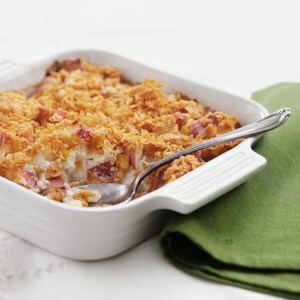 This creamy potato casserole, full of roasted potato slices and a creamy sauce, is topped with crunchy breadcrumbs. It goes well with just about anything--from a holiday roast to weeknight pork chops. 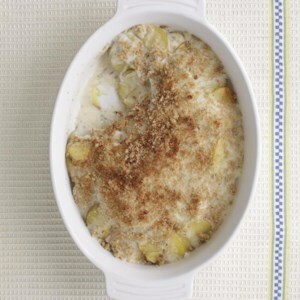 Layers of potatoes and leeks are topped with just a bit of cheese in this healthy gratin. Turkey sausage, potatoes and green chiles star in this easy, cheesy brunch casserole. One bite of this hearty sausage casserole recipe--full of sauerkraut, apples and kielbasa--and you'll be transported to a tiny pub in the Alsace region of northern France. Serve with extra mustard if you like. 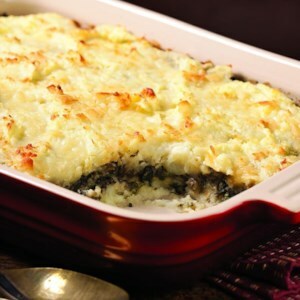 Fancy up regular mashed potatoes with a layer of mushroom duxelle--a sauté of finely chopped mushrooms and shallots. We omitted the traditional butter in the duxelle and added chard for a nutritional boost. Serve this hearty side in place of mashed potatoes at any holiday feast or enjoy it as a vegetarian main dish. Fresh artichokes and potatoes combine in this tasty gratin. Serve with Pan-Roasted Chicken & Gravy and Brussels Sprouts with Walnut-Lemon Vinaigrette. Slivered garlic and freshly grated nutmeg flavor this simple potato gratin.